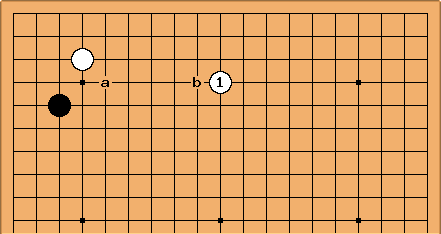 here aims to press White to the third line, creating a position in which White can avoid being low only with some tactical trouble. 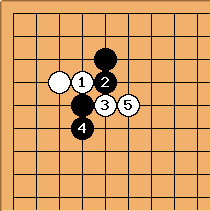 This is joseki, in which some lines are quite simple but others definitely not. Since leads into a pushing battle, tenuki will be costly for both sides in terms of influence. See 3-5 point low approach, press, tenuki variations. This way of cutting through the pressing play is considered to be an overplay, in normal circumstances. It is sometimes playable in conditions when White is strong locally. But in general White has quite a hard time taking care of the corner. (It can end up as a carpenter's square.) Note the windmill pattern. The press is for the most part too simple-minded a play to be seen often in pro games. 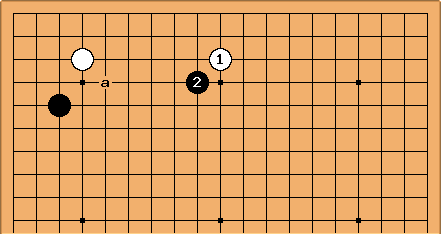 It also gives the opponent territory early on, which is something about which strong players feel a basic reluctance. 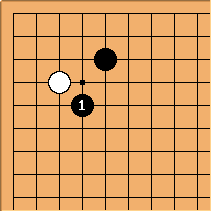 If White has played a pincer on the top side. 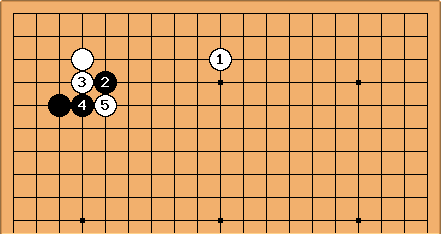 If White has extended along the left side without preparation. It was a traditional teaching that in this case isn't good because would press White unacceptably low. There is probably much truth still in that. White does better to play at 2, before 1; or play a pincer in the top left. Nothing is ever quite that simple, though. White can try fighting this way, making work as part of the overall position. Therefore in games from the early Edo period, when these matters were still being worked out, you see here, anticipating the press at a. These days, one is just as likely to see the extension on the fourth line with . Then Black at a to press has to be seen in conjunction with Black at b - which might be good here, but the timing has to be worked out.